in Bordeaux. Because of the first place at the EUCR central east, Bad Skid was seeded 3rd at the European Club Championships. As the format of this tournament divides the 24 competing teams in an elite and a challenger division, there is not even one easy match to get into game mode. So on Thursday morning, the first game for Bad Skid was against the Swiss power house Freespeed from Basel. Knowing the Swiss from two very close games at the windmill windup this year, there was no doubt about this getting a big fight right from the first point. Due to a delay of the flight from some players, this first point unfortunately had to be played with a reduced Bad Skid team. Nevertheless both O-Line and D-Line did a good job in the first half, keeping the game very tie. A few minutes before half time, the rest of the squad arrived, strongly motivated to be the game changer, by increasing the pressure of the defense. But Freespeed kept scoring points, so the game went all down to universe point. 7 Bad Skid players were ready to get the Defense and afterwards score the point. Unluckily they just fulfilled half of the plan, getting the block but did not score. At the end of this very close game, there was a 14-15 defeat and a small sadness about a missed start. The next game was against Brighton. Not willing to lose two games at one day, everybody was ready to give the British a hard fight. But they fought back. Some uncharacteristic failures gave Brighton an early one break leading. The Bad Skid D-Line had to get this back. And they did this not only once. After some small changes in the defensive structure they started to get more and more blocks. In some case it seemed to be a common goal not to let the O-Line play again. But in the rare cases, where this did not work, the O-Line did their job brining the D-Line back on the field. The conclusion was a 15-8 victory over an apparently disappointed Brighton team. Finishing second in this pool of 3 teams meant to proceed in a power pool with CUSB, FAB and Chevron. The goal was to avoid a pre-quarter match against a strong team from the challenger division, by getting to the top 2 in this pool. Knowing that this day with 3 games will be a hard one, everyone went to bed early. So the Friday started at 10.45 with the game against CUSB. This young and athletic Italian team came to Bordeaux as the first seed of the south region, letting Freespeed and also FAB behind. These thoughts always in mind, the game started rather good for Bad Skid. Some easy scores and a good defense brought the 8-5 halftime leading. The rest of the game is told very shortly. The game proceeded like it began with a good playing CUSB team, but just a little better playing Bad Skid team, collecting some breaks, not giving anything away. The final score was 15-9. Not the worst start into this hard day. The next step to take was FAB. Having beaten them twice only a few weeks ago at a preparation weekend the mindset could have been rather optimistic. But you don’t easily mess up with FAB. The game went surely not like planed. The team from Bern took every single chance to get a break, not giving Bad Skid anything back. At the halftime Bad Skid was down 8-6, but not beaten yet. For sure now the D-Line had to get some discs back and they started immediately. When the score was tied at 13 and the O-Line from Bad Skid received the pull from FAB the game was back in the hands of the German champion. But the next 2 points went – let’s say it british: unlucky. Two drops that happen once a season gave FAB the disc at the German endzone line. 13-15, silence. Nobody wanted to speak. That was awful. Again a Swiss team made Bad Skid disappointed and again a game against an English one had to encourage the Bad Skid minds. The last year silver-medal winner Chevron Action Flash from Manchester, UK was the last opponent of this Up and Down Friday. Loosing was no option, because this would have meant pre-quarter. The game started pretty good with a score and an immediate break to earn a 2-0 leading. As Chevron did not really get into this game in the beginning Bad Skid was able to get in front with some breaks and when the British boys started to bring their “second name” on the field the show was already over. The 15-11 victory saved the second spot in the pool and therefore the possibility to get some more sleep at the next morning. The next game, the quarter final, was supposed to be the most important game of the whole season. Having lost this in the past 2 years nobody wanted to do a triple this time. The game was against a so far rather unknown team Otso from Finland and the message that it will be purchased live on the internet gave everybody additional power. Unfortunately this lead to some overthrowing and a lot of turns in the first point, but finally the O-Line was able to get the disc back and score that important point. This was some sort of characteristic for the whole game. A lot of unforced errors on both sides made this game not really looking like a quarter-final. In the end the difference was, that the Bad Skid D-Line was able to not only convert the unforced errors from Otso, but also getting some big blocks. In the end Bad Skid took home a safe game with 15-8. For the first time in the shot history of this young team Bad Skid reached the semifinal at the European Club Championships. Of course this was something to be proud of, but the journey went on. No one else than Clapham Ultimate, the defending Champion from 2012 should be the one to beat for the final. For sure not the easiest job to do at this moment, but the game started great. Two breaks in a row brought Bad Skid up by two and Clapham in a situation they were surely not comfortable in. But let’s face it: Forcing Clapham to take this timeout was the best thing for Bad Skid in this game. Unfortunately the rest of the game was not the best one from Bad Skid. Clapham started to capitalize on each single mistake from the Germans and they made a few too much of them and even though the defence was enormous it was not enough to get the breaks back. 11-15, defeat against Clapham. The sadness about this was there, but not very long. The focus was now on the bronze medal match: A rematch against the Flying Angels. The weather on Sunday was great for the very last game of this season, a little sunny but not to warm. In contrast to this the Bad Skid players were not only warm, they were hot. Ready to not only get the bronze medal, but also the revenge for this awful defeat in the power pool. Right from the beginning everyone was prepared to do this one step more, to jump a bit higher and to get this disc where it belongs: In the endzone of the Flying Angels. Score after score was made by a Bad Skid player, while FAB was slightly overwhelmed by this Bad Skid efficiency. Even in the end, the struggling phase of the previous game, Bad Skid kept playing a very good game, so Bern never had the chance to fight back. 15-8, Bronze medal. 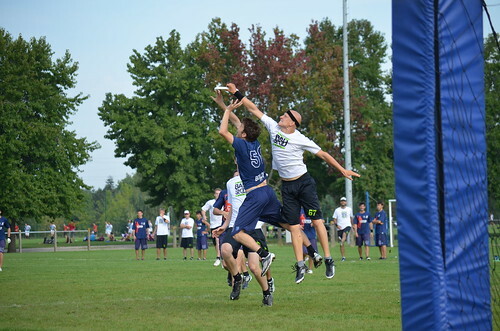 With the last catch in this game by Lennart Vollmer, the 2013 season ended, but let me keep this straight: 2014 is coming and Worlds are waiting. Thank you all for reading our articles, watching Bad Skid TV, liking us on Facebook, buying our Supporter-shirts or simply cheering for us from the Sideline. The whole team can’t wait to see you all again in 2014. We wish you a nice off-season. There’s only one Bad Skid !